Getting ready for a sailing race requires more than 20 jumping jacks and some hamstring stretches. Terry Hutchinson takes you through his pre-race plan. The ultimate goal of the warm-up session before racing is to eliminate surprises. I like to have between 70 and 90 minutes prior to the start as this will allow me a couple of opportunities to sail the first quarter of the beat as the committee is setting a course. So many times the subtle things happen early in a race that can determine the success of the first leg. The fewer the surprises for the first few minutes after the start, the clearer your decision-making will be. My first priority upon arriving at the racecourse is to sail as much of the first beat as possible, set a spinnaker, and run back to the start line. During this time I focus on the upwind and make sure I have a good feeling for the beat. Getting to the top mark first is my top priority. If we’re trying to decide between two headsails, we turn downwind partway up the beat, switch sails, harden up, and get a feel for which jib is doing a better job of balancing the boat. While the trimmers and helmsman are getting a feel for the conditions, the correct sails, and the rig tune, the tactician should focus on all the tactical considerations. Check the current at different points on the racecourse, and see if the weather—both the general direction and velocity, and the timing of the shifts—matches with your forecast or what you know about this venue from previous regattas or local knowledge research. There are a lot of subtleties to study, and so the more time you can give yourself to identify what is or is not happening, the easier the decisions will be once the race begins. If you’re presented with the opportunity to line up with another boat, take it. So many questions can be answered by positioning your boat two lengths from a competitor and speed testing. These tests can and should be lined up in advance with a reliable competitor; one you know will show up on time at the designated spot. Don’t take this agreement lightly, or blow it off. You may find it tougher to arrange the next time around. The best line-ups will have the two boats fairly close together—to ensure you’re sailing in the same breeze—and the leeward boat either bow-even or slightly bow-forward. If you’re the leeward boat, be sure you allow the windward boat to sail normally. If you get too far forward, or too close, he’ll eventually fall into you and neither of you will learn very much. After 5 to 7 minutes of sailing, tack, switching windward-leeward positions, and repeat. I guarantee trends will be noticed. Sometimes, however, you may not have 90 minutes. If you get to the top of the course area and there are only 45 minutes to go to the start, set the spinnaker right away, sail downwind, and round the race committee boat. From here do the first half of the beat and then relax for a bit. Get the boat ready to race, and discuss the general impressions of the legs just sailed. Motoring past the top mark area and all the way to the start may seem like an efficient use of time, but it will often put the team into a frenzy as you try to pack all your research plus the upwind and downwind speed and boathandling warm up into a short period of time. Sailing downwind may take a little longer, but it allows the team to get in sync with the wind and waves and get a feel for the conditions. Plus by the time you’ve reached the committee boat, the team is warm, you’ve done the pre-race spinnaker set, and the whole crew can focus exclusively on the first-beat and upwind sail tune research. Whatever time you have, use it wisely. I will almost always prioritize tactical and boatspeed research over boat-handling practice. You are not likely to solve bigger boat-handling issues in this short period of time. Instead, you'll likely chew through all your warm-up time and go into the race without a strong idea of what to expect or whether the boat is going well in the conditions. Finally, I always build in an 8- to 10-minute chill period before the start. 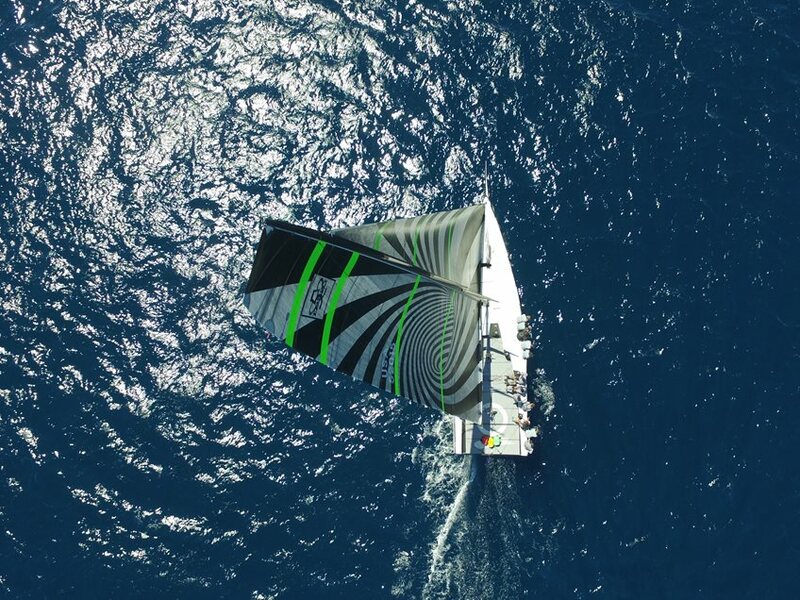 This is enough time to discuss the upcoming race in a low-stress manner, and gives the team an opportunity to think about sail selection, and to fuel up and hydrate. Originally published on SailingWorld.com as part of the Terry's Tips column.